Reverse-chronological list of updates to existing articles. Most of the time, I don’t create a new article, but rather add information to a related existing article. 1/202019 In the wake of the death of Officer Townsend, the news and legislature is all abuzz with a ideas for a ban of various flavors of cell use while driving. Added info about an interesting NC case involving a cell-distracted driver who was convicted. Along with a tidbit related to how impeding (in NC, like AZ) cannot apply to non-motorized vehicles. 1/13/2019 Tempe enacts bike/scooter share company regulations; these regulations do not address operating rules. Scottsdale had already done similarly in late 2018. 12/1/2018 Wanted to mention to be sure and check out Designing for Cyclist Safety presentation from Andrew R. Cross, P.E., PTOE. Andrew is a Traffic Engineer with the city of Cincinnati. It’s richly illustrated, covering door zone BLs, cycle tracks, mixing zones, etc. 11/28/2018 The driver, mentioned below, that killed a person back in 2016 while DUI, running a red light, and hit-and-run was sentenced to 8 years on prison. 11/1/2018 Very drunk, red-light-running, hit-and-run driver convicted last week in 2016 killing of a bicyclist in Tucson. There are a number of oddities, mostly why was the driver convicted of negligent homicide (the least-serious type)? Sentencing should be watched closely. Similar cases routinely have defendants plea guilty, meaning no trial, to manslaughter. Also the crash typing got this one completely wrong, it was not “motorist overtaking”. 5/31/2018 A driver who runs over a ped in a crosswalk is liable for the crime of Causing Death/Injury by Moving Violation, 28-672, and although it’s not a serious crime, it is significantly more serious than a traffic ticket; strangely a driver who runs over a ped and even kills a ped walking along a sidewalk at a driveway has committed no crime; despite the fact that driver has the absolute duty to yield to peds there… This seems like an oversight. 2/15/2018 Met with Julian Dresange, City Traffic Engineer, City of Tempe in a meeting set up by Joe Struttman, Pecos Action Group. Mostly discussed the impending re-working of McClintock which will add a through travel lane southbound but squeezes the buffered Bike lane; particularly at the bridge over US60. Julian was very generous with his time. Also Joe pointed out that Phoenix has an updated sawcut ordinance. 2/13/2018 The seemingly never-ending saga of buffered bike lane on McClintock Drive in City of Tempe is entering its next phase: a third southbound general purpose thru lane will be added back at great expense the entire distance. That is an attempt to relieve PM motorist congestion. The ‘easy’ portion will be restriped beginning Feb 2018. Other portions will require costly construction. The Bike Lane at US60 bridge deck will likely be ‘shoehorned‘ in, and bicyclists will be, um, encouraged to use a sidewalk bike path southbound at the RR underpass. Oh, and no plan to fix the bad/wrong edge line on McClintock at Elliot; that didn’t make the cut. 2/6/2018 After 11 years, the AZ legislature is finally moving forward on a “texting” ban. SB1261 passed Senate Transpo committee. “Just before casting his vote, committee Chairman Rep. Bob Worsley, R-Mesa apologized to the public for taking so long to move the bill forward. ‘Sometimes it just seems like our political ideology gets in the way of common sense’ “. 1/29/2018 In the wake of the tragic death of cyclist Xiaoying Wen in a Tempe crosswalk the city of Tempe is considering changing/updating cyclist right-of-way rules. This is potentially very involved and intricate. See letter and replies from Councilman Keating. 1/11/2018 lane-splitting is lane-sharing; motorcyclist lane-splitting could soon be legal in AZ. Motorcyclist splitting and Bicyclist sharing have much in common. 1/6/2018 — Unusual case in CA, it seems to me AZ (and other states where bicycles are not defined as vehicles) probably has the same anomaly with regard to hit-and-run law: bicyclists when operating on paths, appear to not be subject to hit-and-run laws. 1/2/2018 – Sidewalk riding continues to be suggested by the mis-informed as a solution to any bicycling problem, see recent/ongoing McClintock Drive kerfluffle in Tempe. Updated Where to ride on the Road with some additional stats and info on sidewalk riding. “The rate of major injuries… was greatest on sidewalks”, “Results suggest a need to discourage sidewalk cycling”. 12/26/2018 — Scottsdale explicitly bans any device with a motor (like e.g. ebikes, motorized bikes) from any of the city’s paths. They also, arguably, ban e-bikes from the city’s mountain preserve trails, claiming they are motor vehicles. 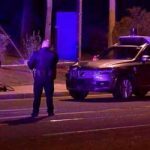 11/22/2017 ASU doctoral student killed in Tempe crosswalk crash; In declining to cite the driver, Tempe police have stated that, under city law, bicyclists must always yield right-of-way in a crosswalk.